I pulled this lovely vintage Christmas picture from my PrintMaster 11 program. A time when all toys didn't have to do something to be fun and time didn't seem to rush by in such a hurry. 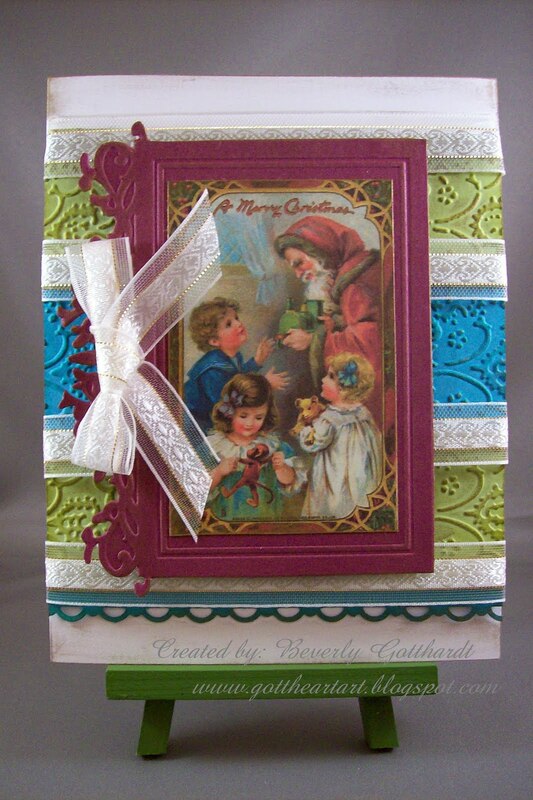 You won't find any stamping on this card, but a lot of dry embossing, and inking, and a little cutting. I didn't have Kiwi Kiss paper so I used Certainly Celery with Kiwi Kiss ink and gold metallic rub-on. Supplies: White Card Blank 5" X 6 1/2" Halcraft, Papers: Stampin Up-Rich Razzleberry, Certainly Celery, Tempting Turquoise, Ink: Stampin Up-Bermuda Bay, Kiwi Kiss, Craf-T Products, Inc.-Metallic Rub-ons-gold, Cuttlebug embossing folders-Wen's Window, Textile, Stampin Up-Scallop Trim border punch, ribbon-Offray, pop dots, glue dots. Bev, this is just lovely! Great job. I love holiday images like this. Beautiful vintage card for a young child. Oh how I remember the days when I was to young to worry (or care) about the hustle, bustle and responsibility that comes with adulthood. Thank you for sharing with us at Bah! Humbug! oh this is totally gorgeous Bev - love it. Irene is in Spain at the moment - she is a great vintage fan. Hope she gets chance to check this out when she gets back. She would love it. Beautiful! I love the vintage feel! Thank you for joining us at Tuesday Throwdown! I hope you will join us again next week!